I have worked in several areas in art and design, beginning with a career in landscape architecture. From there I went on to pursue fabric design, magazine illustration, window display, and decorative painting. In addition, I have been a birth assistant, chef, holistic health counselor, and musician. 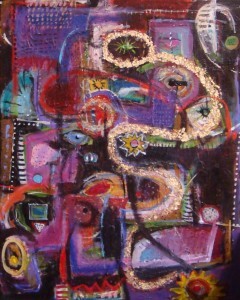 My interest in healing and spirituality further sparks my latest pursuit: abstract expressionism. Painting for me is pure adventure and spontaneity, starting with no particular expectation of the finished product but the faith that it will evolve and emerge on canvas. Color, movement, and sound flow from hand and brush at a moment in time. This is painting from the heart. When it begins to look recognizable and hold some meaning for me and an eventual dialogue between the heart and mind begins, I often embellish with symbols such as stars, faces, hearts, houses, birds and swirls. I like to layer colors and textures for extra depth. This largely intuitive process results in colorful works which are exuberant and uplifting. I am often told that people hear music through my paintings, and that they make them very happy. I live in an old farmhouse in New Jersey with my two children.